Preceding and throughout the Liebherr 2018 World Championships, the motto was "to the next level"; now some nine months after medals were presented and the curtain closed, the principle of "to the next level" continues in earnest. Successful collaboration between the Swedish Table Tennis Association and Halmstad University has facilitated an agreement being signed between the two organisations involving elite sport being combined with academic study; the two parties will develop international elite coach education aimed at coaches from all over the world who have ambitions to work at national team level. Alongside Mattias Nilsson, Deputy Head of the Academy of Health and Welfare at Halmstad University, Petra Sörling, member of the ITTF Executive Committee was delighted to sign the documents in her capacity as President of the Swedish Table Tennis Association. "We are very happy to continue our co-operation with the University of Halmstad, Halmstad Municipality and Halmstad Table Tennis Club; for us, this is the true legacy after the World Championships. We have a need to sharpen our education programmes, we are excited about the opportunity to create cutting-edge education at international level together." Petra Sörling. Importantly, for the Halmstad University, it is part of a long term and conscious strategy to seek co-operation between the business and sports sectors alike; a policy which has been developed following the appointment of Urban Johnson, Professor of Psychology at Halmstad University. "The dialogue with the Swedish Table Tennis Association and Halmstad Municipality has been very positive and we're very pleased with the agreement. For us, this means that we further strengthen our sports profile and become even more attractive as an institution for current and potential students," said Urban Johnson. Notably, Halmstad Table Tennis Club provides the practice environment for students with table tennis as a sport on the Professional Sports Career and Work Life programme at Halmstad University. Eventually, the students will be able to take coaching roles; a situation applauded by Ola Magnusson, Department Head Sports and Leisure, Halmstad Municipality. 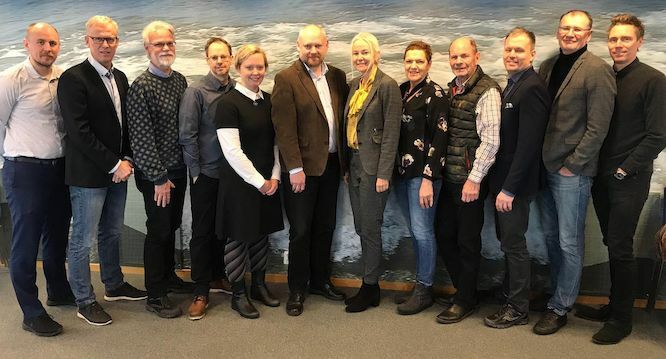 "We are very pleased that an additional elite environment is being established in Halmstad and that the co-operation between Halmstad Municipality, Halmstad University and national sports associations is being further developed. The positive effects are many; the elite environment in table tennis makes it possible for table tennis playing children and youth to play in the highest league in their home town and it promotes the development of the local club to name," stated Ola Magnusson. Positive responses, it is the very same reaction from Mikael Andersson, High Performance Director of the Swedish Table Tennis Association and Thomas Buza, and Secretary-General at the Swedish Table Tennis Association. "It feels great that all conditions are in place and that we can now start develop this high level coach education. Swedish table tennis needs more and better educated coaches and we truly believe that this will increase the status of the coaching profession in general. The international perspective makes it even more exciting! We hope for a really close co-operation with both the International Table Tennis Federation and the European Table Tennis Union. Good networking possibilities and intentions for exchanges are also available with the Shanghai University of Sports and China Table Tennis College." Notably the University of Halmstad played a major role in the promotion and organization of the 2018 ITTF Sports Science Congress which was held in the two days prior to the Championships.